This month's freebie from our sponsor Monarca Language is a wonderful set of activities to practice lowercase and uppercase vowels in Spanish. 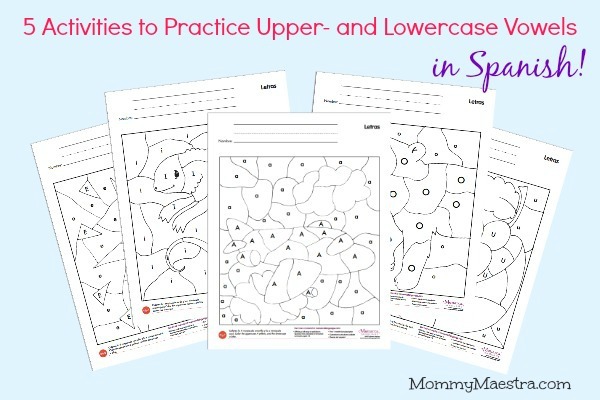 Perfect for preschoolers and kindergartners, these five pages develop letter recognition. If you are not familiar with Monarca Language, it is a most fabulous resource for families with preschoolers at home and who are raising them bilingually. If you have chosen to homeschooler your preschooler, Monarca Language has a complete curriculum that you can access online. You can read my review of the program here, and try out lots of free printables from them here on my site. If you have a 3 or 4 year old at home, it is very important to be working with him (or her!) to prepare him for kindergarten so that he does not start school already behind. Teaching your child is simple, and even more so when you use Monarca Language!